An employee from Cleaning Express was awarded a prize during the 2018 LOO (Let’s Observe Ourselves) Awards. Organised by the Restroom Association, a non-profit organization that advocates for clean public toilets in Singapore, the LOO Awards aims to recognize organisations and individuals who have contributed to help Singapore achieve a world recognised standard of restroom cleanliness. 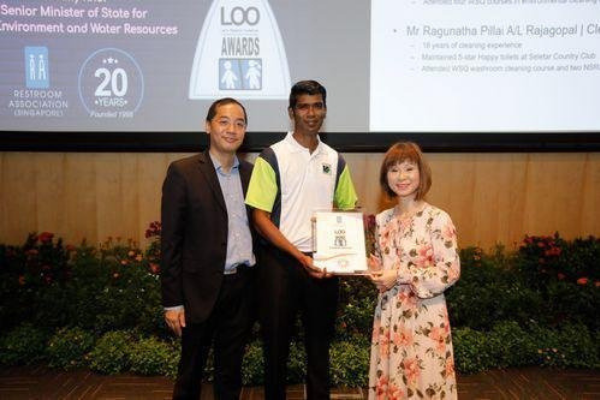 Ragunatha Pillai, a restroom cleaning attendant, who has been working at the Seletar Country Club in Singapore for the last 18 years, was a recipient of the prize in 2018. Ragunatha’s award was also featured in the Seletar Country Club Magazine.